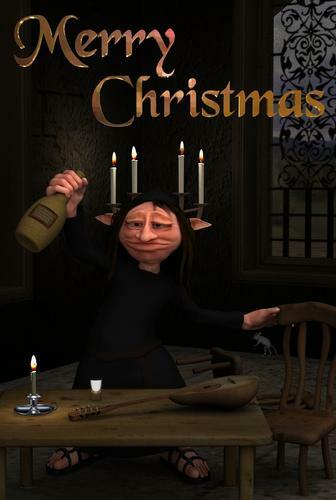 This month’s contest is about how you celebrate this time of year, whether it’s the Christian Festival of Christmas, the Jewish festival of Hanukkah, the Islamic Eid marking the end of Ramadan, the Scandinavian Yule (Winter Solstice) and for Atheists, a time to gather and be with friends and family etc. 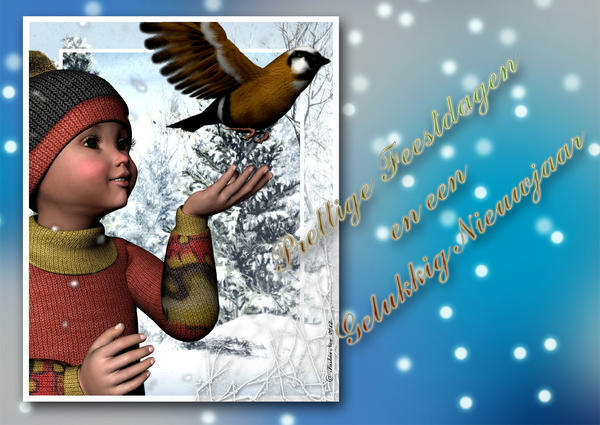 Intent: To make Festive Card showing what this time of year means to you oh and to have fun. I am not expert but in the spirit of learning we will be looking at Composition, the do and don’t of how to get the best from your images. This thread is intended to be used to share your progress or possible final submissions with the members of the community as well as those running the contest. Please feel free to post your images for advice and tips, to get feedback, or to even just simply show off your hard work! :) Throughout the month I and others will be popping in to give help and advice as you work to make your creative visions for the contest come to life. Please post your final image in the main December New Users Content thread. We have people standing by to give you hints and tips but I will add that “you get out what you put in”. An expert I am not but I have learnt a few things about composition that I would like to share. I don’t always get it right like many artists but following a few simple rules can have a big effect on the end result of your images. I am only touching the surface of this topic of composition as it encompasses many aspects but I am hopeful I will give you a head start and the push to explore this further by yourself. 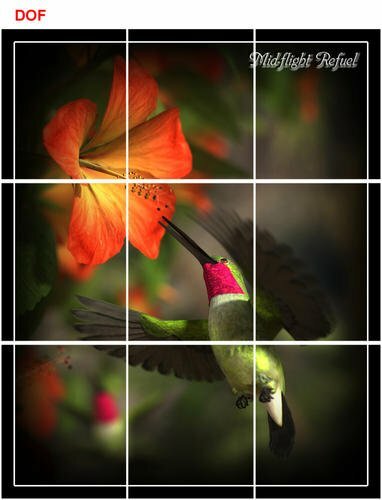 Simply put the arrangement or placement of the all the elements that make up an image but as you will see there is more to just placing figures and props in the right place. Some of you may be aware that we humans are programmed to look at certain aspects of an image like sharp in-focus parts (Depth of Field (DOF)), bright areas and areas that contrast with the background or foreground. We also look left to right but if nothing holds or draws our eye we will linger towards the top left corner of the image. Knowing how to move a viewer around an image can make your art work better and make it more appealing to the viewer, you. But let us start with some simple rules or guides as I like to call them, for placing your subject matter, for greater impact and balance. The placement of the subject matter and supporting props are just as important as good lighting and surfaces. The word rule sounds too confining and like many rules these can be broken but only if you understand the fundamentals first. Golden Ratio: This Golden Ratio was thought to be discovered by the Greeks, made popular, for example by Fibonacci with the Fibonacci number sequence some 1200 odd years later. This Golden Ratio was discovered to be everywhere in nature including us. There are a number of ways to show the golden ratio as the images below show like the Golden Mean and the Golden Spiral which all work on the same mathematical formula. 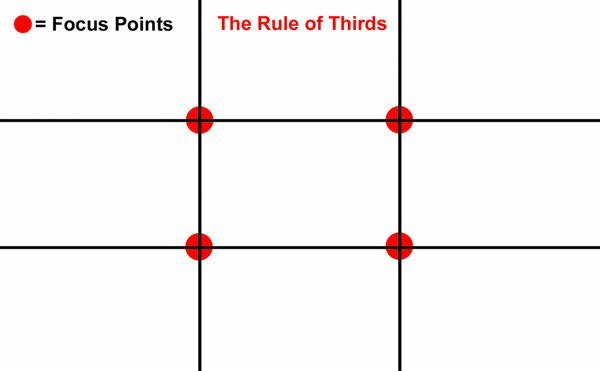 Rule of Thirds: The more modern (general consensus circa late 1700’s) version of the Golden Mean became the Rule of Thirds where the image is divided in to 9 equal rectangles/squares and your focus points are where the lines intersect. 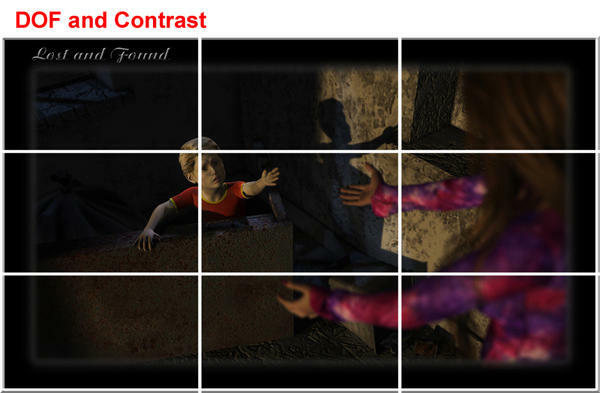 Placing your subject matter on one of these points will generally balance the image. Try not to place any other object on one of these focus points as it will distract the viewer. See the example below where the water dragon is looking out to sea but the dragon swimming in the distance is hard to see and not on a focus point. It could have been placed closer to a focus point for more balance in my opinion. This is the most common guide that many artists refer to but it is just the tip of many tricks we can use. I don’t want to get in to a history lesson or get in to this too deep so if you want to learn more about how these evolved I have provided some links for your convenience. I have read a large number of different articles on this subject, cross referencing to make sure the links contain the correct information. I never trust Wikis unless I can cross reference to verify, which takes hours of internet searching and a few library visits. Take all the examples below done by eye but I think there is room for improvement IMO. :) Look at them closely and see how most things follow the Rule of Thirds. The Horizontal lines are great for landscapes which help to place the horizon line in either one of the thirds. Try not to put the horizon in the middle of the image like I did in the very last example a few posts down. The first two links below show more composition techniques using various geometric shapes which I never would have thought of on my own which opens up more possibilities of composition. Please read all three pages of the first link. 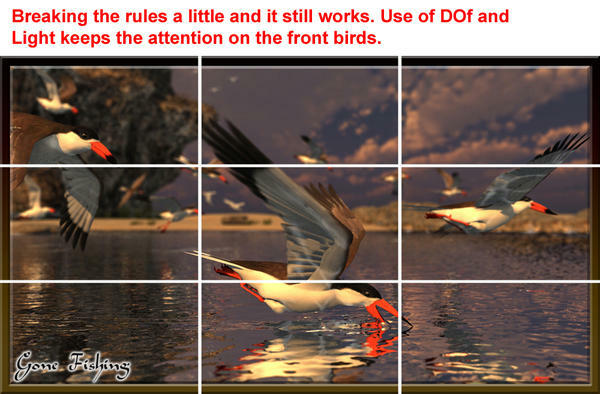 In addition to the rule of thirds etc there are a number of other tricks that aide composition. Let’s go through some of them. Contrasting colours and light between the foreground and background can help your subject matter stand out more meaning a light foreground against a dark background or vice versa. 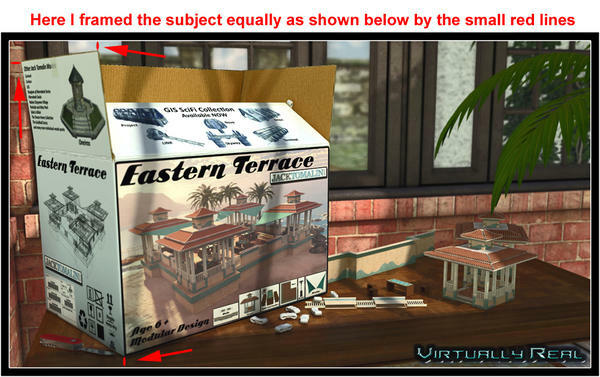 Take a scene with some foreground props with your main subject set further back and a background. 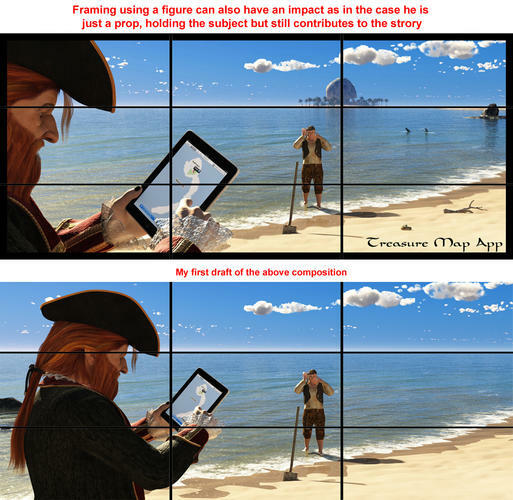 Making the foreground props darker together with a darker background will emphasise the main subject better which should be lighter in this scenario. 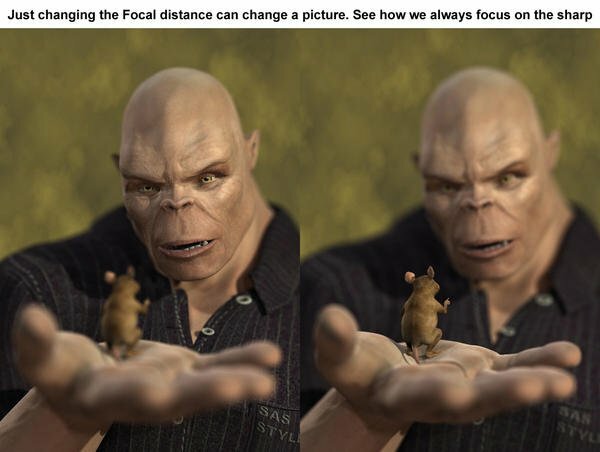 But we could also use the DOF trick to isolate the subject or do both for double impact. You can also use Rim lighting (side or/and back lighting) to separate the main subject from the background if the contrast is too low. And as we now know we are drawn to lighter and brighter areas of an image. 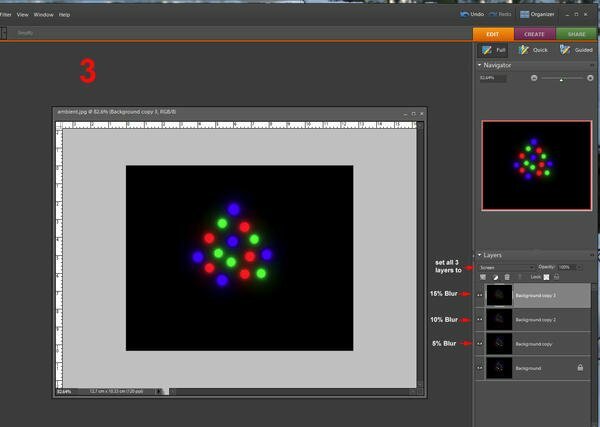 In the example below, quickly made for this little tutorial used six spot lights with three used for the rim and back lighting. 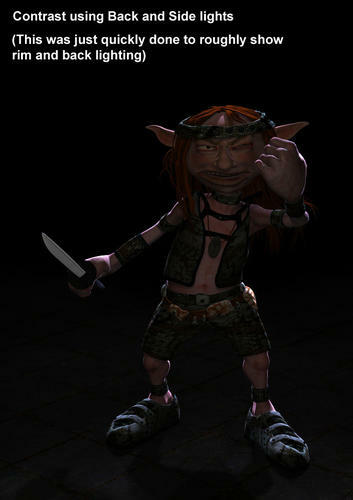 It is a tricky thing to do, with many test renders to get the lights in the right places. One thing to remember when using this technique is to increase the light intensity to 200 – 300% to get the best rim lighting. 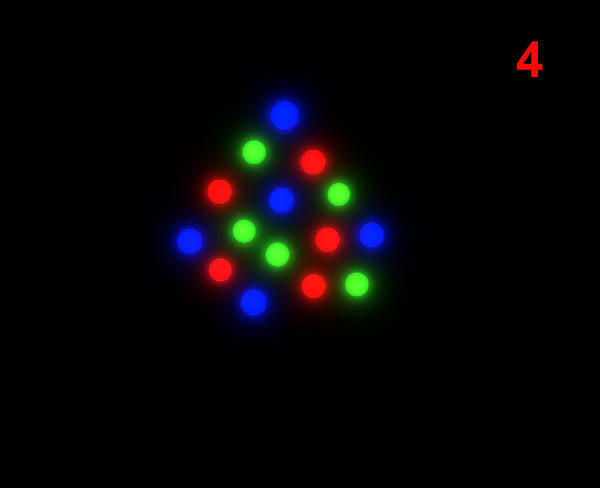 But the intensity will depend on what other Fill lighting you have in the scene. Framing is also a great asset in getting a balanced composition. Try not to cut off big props in a scene, for example a pillar, don’t cut it in half but use the entire width of the pillar placing the outer edge hard up against the edge of the image. When doing tightly framed compositions try to keep the distance to the edge of the image, around the main subject equal as shown below. But as always there are exceptions like cropping a figure in such a way that it frames a part of the picture as shown below. As long as the image looks balanced but don’t be scared to try out different ideas. 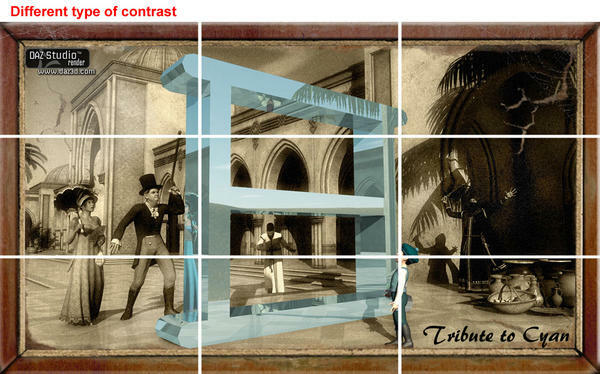 Here is another great composition tip from LycanthropeX in the last WIP New Users Contest thread. I've noticed a tendency among new users to do very wide shots in their images. They keep the camera way back and try to get everything in the scene. In Film making we call this an Establishing Shot. In a movie the purpose of the establishing shot is to show where we are and who all is there. In a movie this shot is normally very quick, lasting only a few seconds on screen. 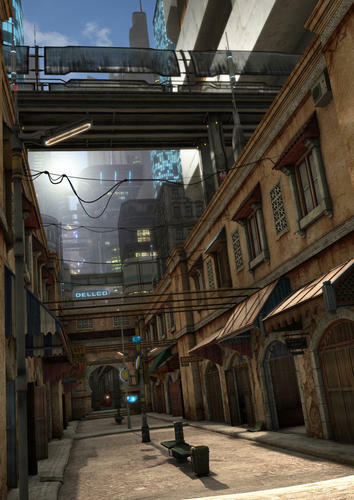 For a movie or a comic book an establishing shot can be very useful. It gives the audience important information about what they are about to see and it does it in a quick efficient manner. But for still artwork that is meant to stand on its own it is not the most interesting type of shot. For still artwork the next cut would make the better composition. Usually the next thing we see in a movie after a wide establishing shot is a tighter shot on the most important character in the scene, with just a hint of what is going on around them. If you find yourself doing these wide establishing shots, stop and ask yourself, who is the most important, most interesting person in the scene? When you have that figured out punch in on them, get the camera in close. Don't let the viewer's eye wander. Make a bold statement, you want your image to scream "THIS IS WHAT MY IMAGE IS ABOUT, NOW LOOK AT IT !!!!!!!" That is what works in a still image, that is what gives your image power. Your image is your voice, don't whisper, I want to hear you yell!!! If you want to zoom in on a figure and you don’t want much of the background visible try zooming the Camera’s lens from the default 65mm to 90-100mm this will narrow the field of view a lot more. This is true of the opposite, lower the lens size to 25-35mm the wider the field of view the more background will be visible. The above techniques, as I mentioned earlier, are just the tip of the very big aspect of art and design. Bringing many of these tricks and techniques in to one image can make your images more appealing, especially to yourself, furthering your desire to learn more and grow as an artist. Also with knowing and understanding composition like this can enable you to start to break to rules, to be more adventurous and creative. The image below is one I made a while back and it did surprise me how it breaks the rule of thirds etc but essentially still works. Now you know why I call then guidelines. We could go on for quite some time here about composition techniques but I hope I have got you interested in learning more about this subject on your own and in your own time frame of learning. I found all that above hard to do as I realised some folks were right, I find some of this comes natuarally......NOW. But in my opionion I still have a long way to travel. Ok that is enough about me now it is all about you, enjoy. Still in the idea stage, and I thought I might have a bit of fun with this one. 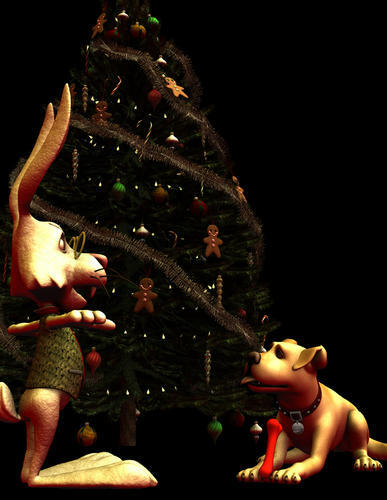 What if there was a communication glitch and the easter bunny arrived on christmas eve instead of santa? So I've been thinking about the contest concept for a few days, and the only idea I've come up with is so far beyond my skill level in DAZ Studio it's not even funny. I don't really celebrate Christmas the same way as other people do, but I truly love all the lights. They just make me a very happy camper, which is a good thing during the busiest time of year for dog groomers, which is what I am during the daylight hours. So. I tried an experiment last night, and couldn't make a light glow. 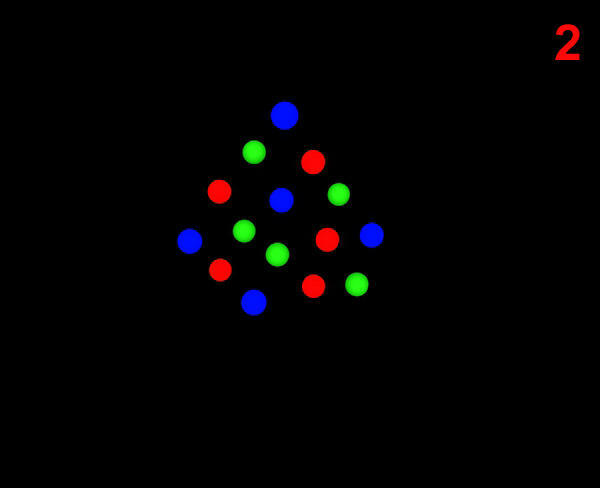 How does one go about making beautiful glowing Christmas lights? I could do it in Bryce in a heartbeat, but that would defeat the purpose of the contest. 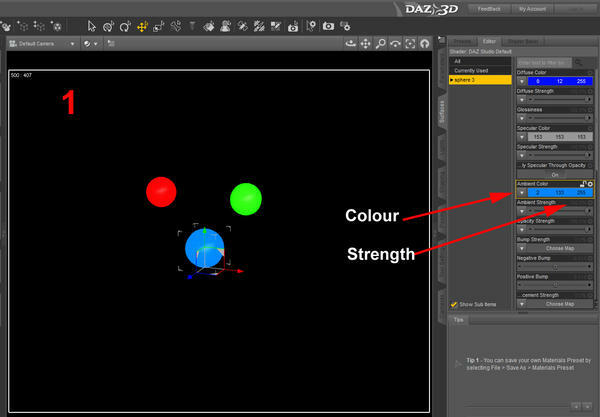 But if you want to learn Daz Studio then here you go on making glowing lights. Most Christmas tree light etc aren't that powerful in terms of lumen output so this works well. It can also be used for distant lights in a scene etc. 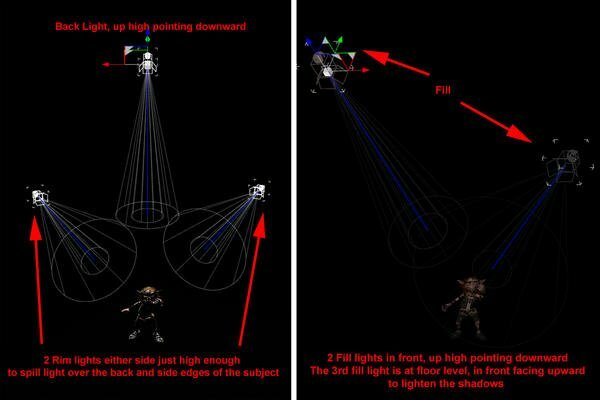 However if a light source is powerful enough to illuminate larger areas then using point lights might be a better option. 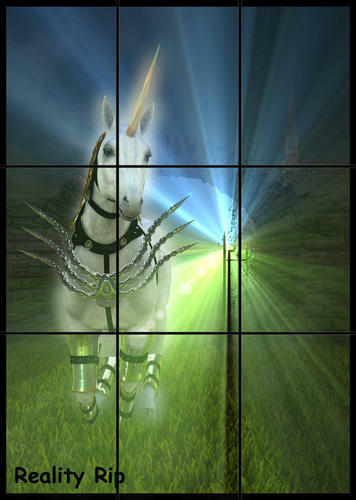 Anyhoo has is how I do glowing lights in Daz Studio. This is just a quick and easy why to show how it is done. First off we need to turn on the Ambient colour channel in the surfaces pane. Select the item and go to the Surfaces Pane. See image one below. Then after you are done and the scene has been rendered properly with lights etc we then turn off all the lights and render again. 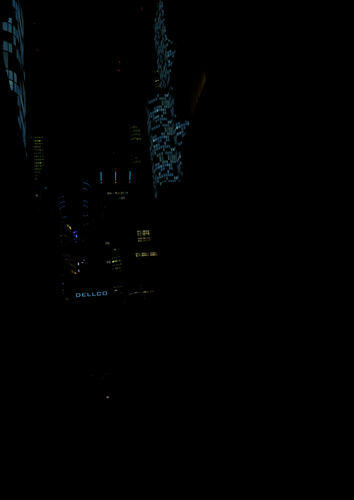 This will be our glow layer render. See image 2. Image 4 is the end result. As you can see all the surfaces that have some ambient levels applied renders when all the lights are deleted or turned off. This was then overlaid on top of the main render as described above..
Wow... Thanks a million for the light info! I never would have figured that out on my own. Can't wait to get busy making pretty lights, yay! Ah, OK, now that is a very fair admission, thanks for that. Thank you Ilena52 hope it helps. 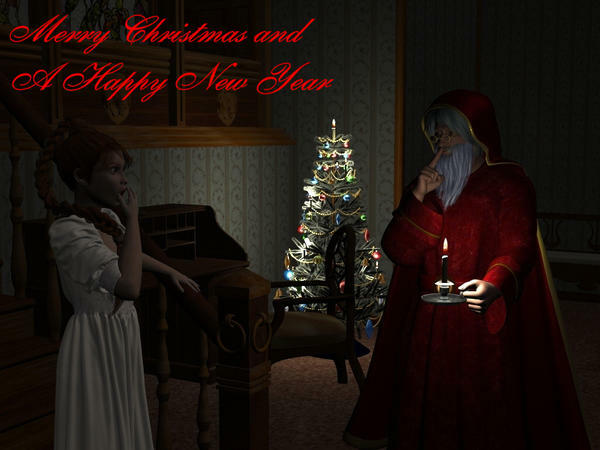 Here's a render I did for a Christmas card 2 years ago. It consisted of 2 separate renders layered one over the other in postwork with the text added as a separate layer. BWSman thanks for posting that great example and great image. Question: what makes one a new member or not? New User..not member...like sithkitten knows Bryce but is new to Daz Studio.